Axis desk rail, powdercoat finish. 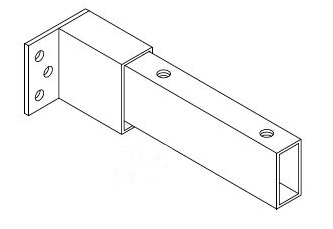 Axis stop end bracket for Axis and Anvil desk & return settings. Left or right hand configuration. Axis bottom rail for bar leaners, powdercoat finish. Axis single 120° corner leg, powdercoat finish. Axis single 90° corner leg, powdercoat finish. Axis single meeting table leg, powdercoat finish. 690mm high. Axis extension rail, powdercoat finish. Axis coffee table leg set, powdercoat finish. 425mm high. Box of four. Shared leg for Axis/Anvil single side desk, powdercoat finish. Packed in singles. Axis 90° corner leg set, powdercoat finish. Box of four. Axis custom desk leg set, powdercoat finish. Axis meeting table leg set, powdercoat finish. 690mm high. Box of four.